Here's a fun holiday decoration. I got him at a now-defunct store called "Franks" (if you're from Chicago you may remember the Franks chain – that odd mix of arts, crafts, plants and planting supplies), and paid all of $ 5.00 for three feet of freakishness. "Five dollars!" thinks I, "I must have it!" I took it, paid for it, and ran before anyone could decide it was really much more expensive than that. Surely someone made a mistake! And I wasn't about to tell them. The kids were little when I bought Freakish Santa. They were a little scared of it, and I can kind of see why. The thing has eyes that seem to follow you around the room. 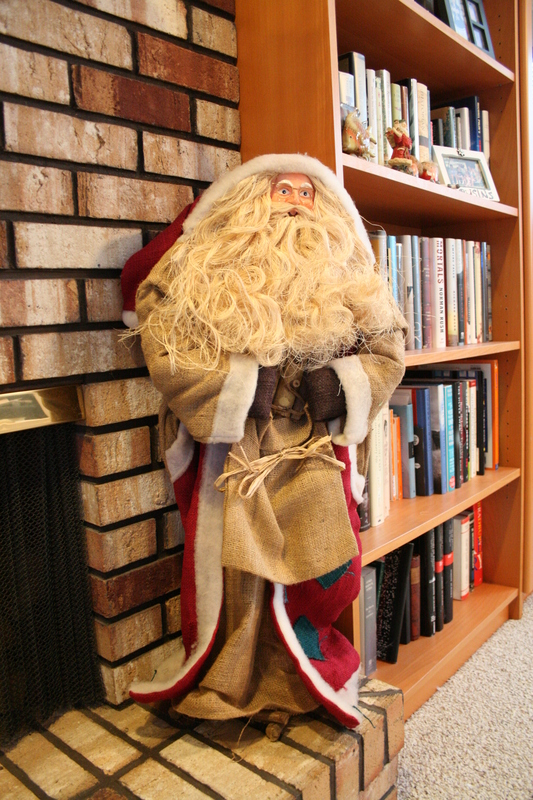 There were times, finding myself home alone with Freakish Santa, that going into the family room gave me the chills. "Well," thinks I, "maybe I didn't really leave the vacuum there." And ZIP! Away I went, looking over my shoulder to assure I wasn't followed. Still! Five bucks. Even if he does have an awful lot of hair, and a freakishly small head. Oh, and those eyes. Those beady, beady eyes. It looks good, sure. 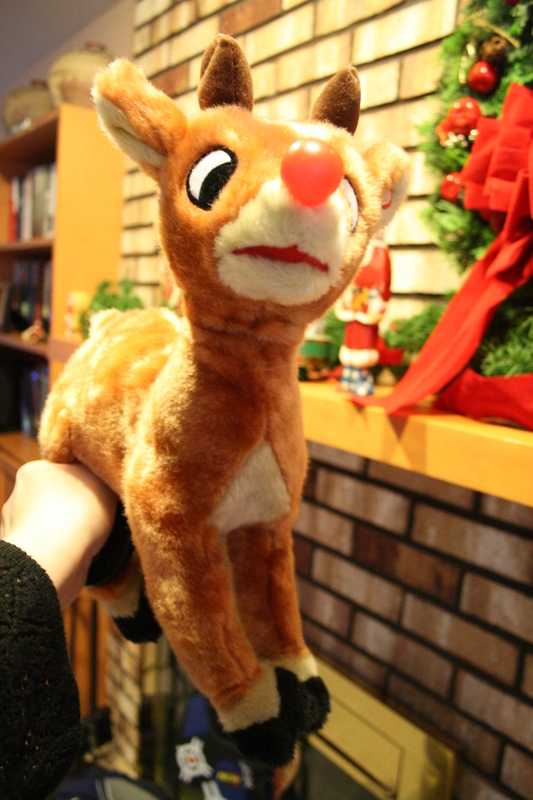 It's a cute little guy from the cartoon version of "Rudolph" those of us in the U.S. grew up with. When you squeeze one of its hooves his nose lights up and it sings 'Rudolph the Red-Nosed Reindeer' until you're ready to break your own ear drums. After fifty or so verses the thing becomes not so cute anymore. And when kids are little? They like to hear things over and over and over and over and … Until I chase them around with Freakish Santa until they cry and hand over the damn reindeer. 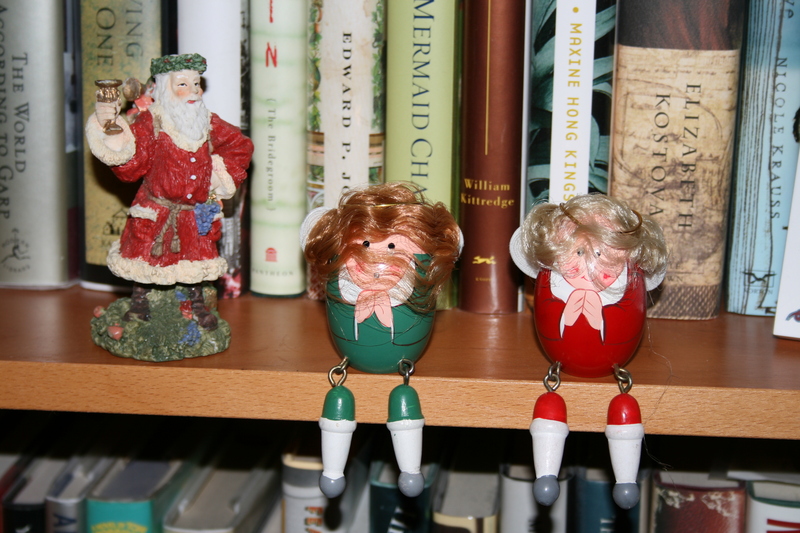 Finally, these two egg-shaped angel dudettes. No special story behind them, save my mother in law gave them to me a very long time ago. Possibly before I'd borne children. Before I knew about the evil of stretchmarks, the precious nature of sleep, and how nice it is to look down and see your toes instead of a vast expanse of rounded skin. Is there any significance to their egg-shape? If you know, tell me. Then we'll both know. Otherwise I'll assume Humpty Dumpty crossed genes with a couple angels at some point. Was it before or after he was put together again? We may never know. Either that, or it was my MIL's subtle fertility hint. Thanks for taking another trip 'round my holiday decorated house! Sorry if I frightened any of you. But look! Freakish Santa's looking at you! Sorry. Control mechanism. It's hard to stop acting like a parent. Previous Post Mafia and Bribes and Corruption … Oh my! Next Post The Great Grade Wait 2008. Say that three times fast. Quickly. Whatever.